Western Libraries is currently accepting applications for the 2018-2019 Western Libraries Undergraduate Research Award. This year, we are expanding the submission period to allow eligible students to submit work completed during the spring and summer quarters of the previous year. Each Undergraduate Research Award winner receives $500.00 and publication in Western CEDAR, Western’s institutional repository. For the past five years, awards have been given annually to students who demonstrate outstanding library research in the writing of papers for college credit courses that were taught at Western during either fall or winter quarters of the current academic year. With the new expanded submission period, you can now enter research projects that you completed in the spring and summer of 2018, as long as you will be enrolled as a student at Western during the spring of 2019. In your Libraries, we know that quality student research takes place throughout the academic year. Very often this work is completed in spring quarter at the end of the academic year, as research and writing knowledge builds and improves through experience and practice. We want to recognize and reward the quality work of students while they are here at Western. Undergraduate research at Western is a significant way students connect with and explore the world around them. Collaboration between faculty and student is an integral to teaching and learning, which Western Libraries encourages by providing the resources and support students need to complete their research. Now in its sixth year, the Libraries Undergraduate Research Award has grown to honor research from an array of disciplines. In the past, awards have been given to student research in the areas of Chemistry, Economics, Journalism, and Linguistics and Community Health. We encourage students to apply and faculty to consider nominating one of their outstanding students. If you are a student who would like to apply for this award, or a faculty member who wishes to nominate a student, please see the full award guidelines and details here. Applications are due by April 16, 2019. 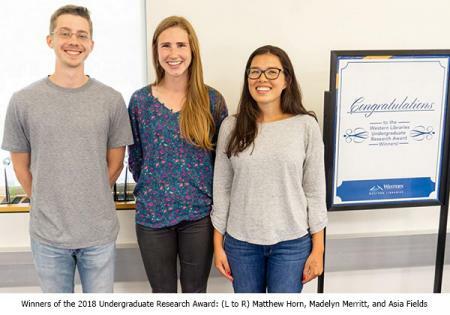 This year, the Libraries Undergraduate Research Award winners will be announced on May 14, 2019, the first day of Westerns Scholars Week. Questions? Contact us here.